The Rich & Associates Planning Team has been busy this summer! 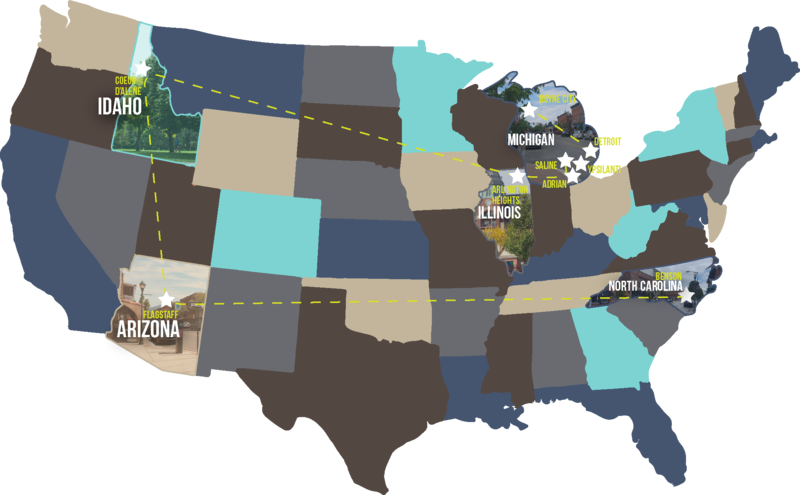 We added an additional four stops to our roadmap with studies in Flagstaff, AZ., Boyne City, MI., Adrian, MI., and Ypsilanti, MI. In Flagstaff, AZ., we spent a full week in July conducting a parking study update consisting of 48 blocks in the Downtown area! In Boyne City, MI., we conducted a week-long study at the end of June reviewing parking pertaining primarily to the downtown area, and will be making recommendations to meet the communities current and future needs. In Adrian, MI., we will be assessing the current and future parking conditions of Downtown Adrian to provide the city with improvements to their parking system. In Ypsilanti, MI., Our team will be working to create a long-term, sustainable parking strategy including a supply and demand assessment; recommendations for both infrastructure and parking system management; recommendations to develop, deploy, coordinate, or support alternate modes; and a financing and implementation strategy.